WASHINGTON, D.C. -- Violence on Rapa Nui Island, also known as "Easter Island," continues to escalate and the international community needs to pay attention, according to experts at the Indian Law Resource Center. On December 29, 2010, Chilean armed police began another round of evictions targeting members of the Rapa Nui parliament. According to witnesses, police beat dozens of clan members with clubs and arrested at least nine people. At issue is a long history of dispute over indigenous rights and unresolved land issues. Earlier this month, Chilean police forcibly evicted members of the Tuko Tuki clan, which led to significant injuries for more than 20 members. The unarmed clan members were beaten and shot with rubber bullets. During a fact-finding trip to the Rapa Nui Island in August 2010, Indian Law Resource Center staff documented first-hand the serious threat the Rapa Nui face with the Chilean police. The Center notified the Inter-American Commission on Human Rights in October, filing Precautionary Measures to protect the indigenous community. Here at the Indian Law Resource Center, indigenous leaders from Mexico and countries in Central and South America regularly inform us about threats to their lives and the lives of their families. Like many indigenous leaders in the United States and Canada, these leaders struggle daily to maintain their territories and the health and safety of their communities in the face of powerful corporations and governments threatening to take everything that they have. Too often, business as usual means threatening or even killing Indian leaders instead of meaningfully considering their concerns. The Center is currently representing 29 clans of the Rapa Nui Nation. The Rapa Nui Nation is the indigenous people from Rapa Nui Island, otherwise known as “Easter Island.” On December 3, 2010, conflict between the Rapa Nui and Chilean police special forces erupted in horrific violence. Leviante Araki, age 50 and President of the Rapa Nui Parliament, was shot with pellets and strangled. He is very badly hurt and afraid to seek medical care. At least 20 other Rapa Nui clan members were shot with pellets and beaten with rifles, some sustaining very serious injuries. 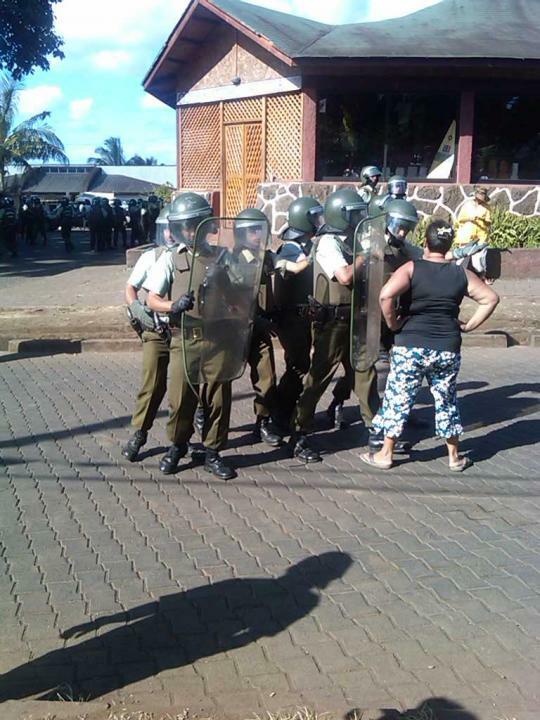 Reports from Chile indicate that some of the police were also hurt when Rapa Nui clan members retaliated with stones. More violent evictions took place on December 29, 2010. The Chilean police targeted members of the Rapa Nui Parliament. According to witnesses, dozens of people were beaten or injured during the forced removal. At least nine people were arrested. The Rapa Nui Nation entered into an agreement with Chile in 1888. Chile used the treaty as license to treat the island and the indigenous people as the property of the state. Several thousand Rapa Nui individuals were sold to Peru as slaves; Chile confined the rest of the people in a small area of the island called Hanga Roa. Rapa Nui Island became part of Chile in 1933, without the consent of the Rapa Nui Nation. Ignoring aboriginal title held by each clan, Chile leased the entire island and the Rapa Nui people to private sheep-herding enterprises without their consent. Until 1966, the Rapa Nui individuals remaining on the island could only leave their encampment with permission. If they left to engage in traditional pursuits, fishing or farming, they were severely punished. Today thousands of tourists flock to Rapa Nui Island to view the Moai (large sculptures created by the ancestors of the present day Rapa Nui Nation that have deep spiritual significance); unfortunately, Chilean policies prevent the Rapa Nui from benefitting from the tourism. Much of the land is in possession of non-indigenous individuals and corporations. Jobs related to tourism go to continental Chileans. Uncontrolled migration to the island has led to a crisis with already insufficient public health and environmental systems stretched to a breaking point. Within this context, the Rapa Nui clans began taking a stand. They occupied the airport, in 2009, to bring attention to the problem of uncontrolled migration. More recently in August, 2010, the clans began peacefully reoccupying their wrongly taken lands. This occupation included a five star hotel, the “Hanga Roa,” being built by the Schiess family, a non-indigenous family, on lands belonging to a Rapa Nui clan. Chile first reacted to the occupations by initiating dialogue between governmental representatives and Rapa Nui individuals. But instead of respecting the Rapa Nui collective rights of self-determination and self-government, Chile refused to talk with most of the legitimate representatives of the Rapa Nui clans. Instead, Chile selected who would participate at the roundtables. Even before concluding the discussions, Chilean forces violently carried out three evictions, in September, in October, and on December 3, 2010. While the previous evictions were carried out in a violent manner, with police forces threatening entire families, including minor children, the most recent eviction entailed extreme violence. The Indian Law Resource Center filed a Request for Precautionary Measures with the Inter-American Commission of Human Rights on October 1, 2010. We expect the Commission to grant protective measures in favor of the Rapa Nui clans soon. In the meantime, we are very concerned about the increasing seriousness of the violence. Reports indicate that more troops are headed to the island. Chile’s President has said that the government will support, with armed forces, the court decisions to evict the Rapa Nui clans. We are sharing this information to put international pressure on the Government of Chile to resolve the conflict peacefully. American Indian leaders, community leaders and individuals concerned about the violation of collective human rights should contact Chilean authorities. Urge Chilean officials to work out this conflict through the Inter-American system. The White House and the State Department should take a stand against these violent evictions. You can express solidarity with the Rapa Nui Nation by sharing this information with others. For further information, please contact Leonardo Crippa, Armstrong Wiggins, or Philomena Kebec at the Washington, D.C. Office of the Indian Law Resource Center at (202) 547-2800, dcoffice@indianlaw.orgor visit www.indianlaw.org. Armstrong Wiggins is the Director of the Indian Law Resource Center’s Washington, DC Office. Leonardo Crippa and Philomena Kebec are attorneys with the Center.